When the national flower and tree are one and the same, carrying the name “Flamboyant,” you know it’s going to be a pretty place. 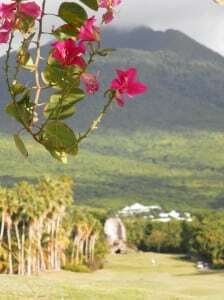 The Admiral’s Cup Pro-Am hosted by The Golf Connection and the tourism board of St. Kitts (whose theme is “Follow your Heart”), proved it so.The jet approach reveals lush hills sprayed with myriad shades of green and white waves lapping all shores. 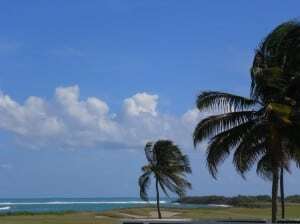 Debark and let not your heart be troubled as the warm breeze washes away any travel anxiety with the sweet smell of sugar cane and friendly faces of welcoming Kittitians. Just minutes away, the Marriott greeting is even sweeter with refreshing eucalyptus cloths and choice of fruit punch or Carib, the island beer. A quick tour of the property ensured action and relaxation options for any non-golf hours. The opening reception required a short but wild ride around the curvy mountain road to the Camambola Beach Club where blue water features flank the patio that lead to the soft sandy beach. Ship lights sparkled on the ocean. The air was warm and breezy, the atmosphere bright and easy as the gang of golfers and significant others mingled, some reuniting from previous events while newcomers joined the club. Golf brings people together. The first island flavors were light and fruity on fresh grouper, chicken and pumpkin soup as the Calypso band played on. An introductory welcome by The Golf Connection president Tom Jaronski with his video preview of island spots and a review of the past events drew wild applause. The stage was set for a fun packed week. Back at the hotel everyone chose their own routes to the beach, the casino, downtown or to their rooms, all eager for the tournament to begin. Serenaded by the peeping tree frogs and ocean waves after a redeye, bed never felt so good. We awoke bright eyed and bushy tailed like the mongoose on the island. We zipped to the Royal St. Kitts course across the road to warm up for Day one of the tournament and as luck would have it, Rick Burk is our pro captain. The fourth should be the Minister of Tourism, Senator Ricky Skerritt but government affairs trump golf so he delegated the player spot to Lee Bailey for day one and Zeke for day two, hoping Parliament would conclude so he might join us for the final round. Lee is a member of St. Kitts who lent plenty of course knowledge. His pars on several holes with his 15 handicap netted birdies. The tourism board set up tents on various tee boxes serving local treats like Ginsing Up soda, Brinley Rum, raw sugar cane for chew and then some. A rainbow of pastels color the hillside homes. Rikki Tikki Tavis dart in and out of the tropical bushes, famed for having cleared the island of snakes. 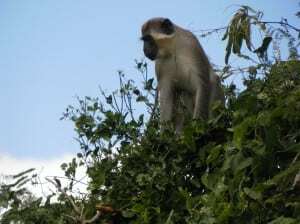 Green monkeys may be sighted as well. It is a gorgeous day and even prettier as the ocean view sneaks up on hole 13, possibly distracting from the tourney task. Number 14 is a short par 4 with more ocean view and a small elevated green requiring a target shot or the ball may return to the fairway (well after its landing). Go over and a flop shot back from the rough will be a trick. Whatever happens on that hole is quickly forgotten with the incredible view from the tee box of 15. One of the most photographed holes in the Caribbean, this one will melt your heart. 16 through 18 follow the ocean back to the clubhouse where we turned in a 12 under, one shot off the dual leading teams. After the round we grabbed a box lunch and headed for the hills, specifically Kittitian Hill one of the two new golf projects that will seal the deal of St. Kitts’ premier golf destination designation. En route we spotted our first monkey on the sugar train track and passed lots of sheered sheep, local towns and inhabitants. Kittitian Hill is a master plan resort with a philosophy of sustainability for distinguishing, sophisticated residents and guests. Built into the rain forest on the highest allowable spot of the island, the panoramic view is nothing short of incredible. The signature course designed by Ian Woosnam will be one of the few in the world with an ocean view from every hole. Part of the environmental sustainabi lity includes using 75 acres within the course for food production. The volcanic soil is so rich that crops pop up very quickly. Hundreds of varieties of plants and trees are in the works. Asked about any monkey business with the crops, Gary Johnston, European Golf Designer said, “There will be enough for everyone.” It is heartening to see the philosophy of merging nature and luxury being fulfilled. Stalled for a few years by the economy, the ingenious plan is back on track full speed with all cottages and 6 villas sold. Part of Preferred Residence and managed by Sedona Resorts, the unique architecture of landscape and interiors is designed by the world renowned Bill Bensley. The cottages, perched high above the sea are open-air designs (including the al fresco shower and tub), with four neighboring islands in view. Bamboo and banana trees will provide the privacy screens for intimate, luxurious living. A village will be incorporated with the clubhouse. Then a beach club for shuttling will complete the grand schematics. The course hopes to open in November of 2013. Back at the Marriott, a buffet dinner on the terrace reunited players with stories and wives who didn’t golf had tales of zip lines, beach lounging, spa treatments and island tours. Not a single sad story was told. It was a pretty St. Kitts day for all. Want more updates on our travels? Follow us on Facebook!